Dryer exhaust hoses are not all the same. 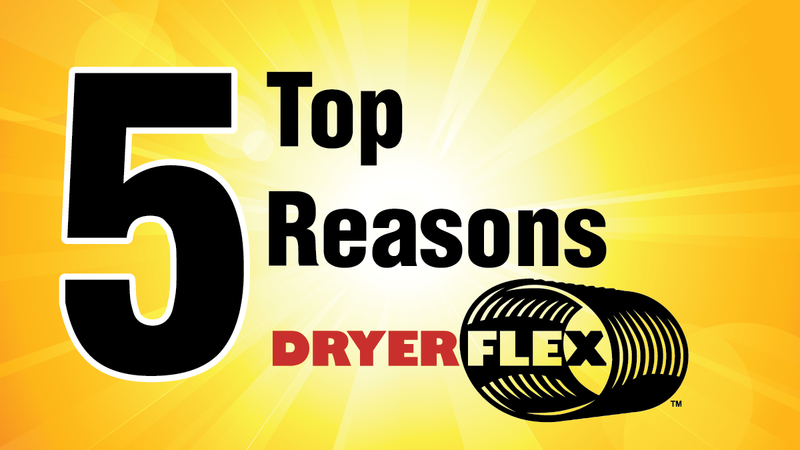 Here are the top 5 reasons to install DryerFlex. DryerFlex is crush resistant, bounces back from impact and is stronger than semi-rigid. In most areas, the use of white plastic and foil flex is against code. DryerFlex is code compliant. DryerFlex combines easy installation and flexibility of foil flex with the fire resistance and airflow efficiency of semi-rigid transition duct. The perfect combination. DryerFlex has been lab tested to stand up to fire with zero flame spread at greater than 480° F. In case of a dryer fire, the extra time DryerFlex provides may save your life and home. Because of important safety and efficiency issues, building code and appliance manufacturers outline very specific requirements for connecting the dryer to in-wall exhaust systems. DryerFlex is UL2158A Listed and won’t void your dryer’s manufacturer warranty. DryerFlex always maintains its four-inch diameter, so there is no need to cut it for installation. If you need to pull out your dryer, the excess DryerFlex moves with your machine, rather than having to disconnect and reconnect. Now available at BetterVenting.com. Get yours today.